As 5G radio system research is rapidly developing and is attracting significant global interest, a team of researchers at Tampere University of Technology (TUT), led by Prof. Mikko Valkama,has been developing and building an advanced radio transceiver concept for improving the spectral efficiency of future 5G net-works. 5G networks are aiming at very large data rates, very high capacity, very low latency, and very fast response time. The developed prototype is based on the principle of wireless in-band full-duplex communications, which means that transmission and reception are performed at the same time on the same center-frequency. Thus, all of the temporal and spectral resources can be used for both transmitting and receiving data, unlike in the traditional frequency-division or time-division duplexing based schemes. This can as much as double the spectral efficiency,which is a highly tempting feature for the upcoming high-data-rate 5G networks. However, the prevalent technical challenge in such an in-band full-duplex transceiver is the own transmit signal,which is a powerful source of self-interference for the sensitive receiver circuitry. Thereby, without highly efficient attenuation of the own transmit signal in different parts of the receiver chain and antenna interface, in-band full-duplex communication is not possible. Recently, in close collaboration with Intel Wireless Labs, there searchers at TUT have managed to greatly alleviate this problem by using various advanced RF/analog and digital self-interference cancellation techniques. With the current version of the prototype, the own transmit signal can be attenuated by as much as 110 dB, in spite of adopting low-cost RF components, already allowing for true full-duplex operation with low-to-medium transmit power levels. 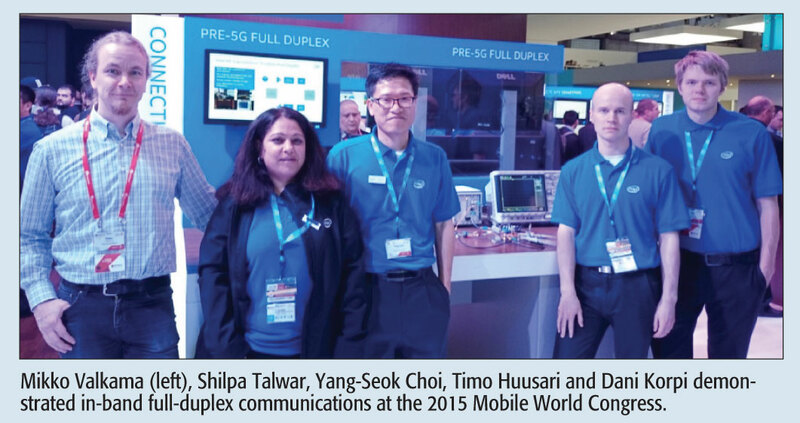 This was also demonstrated at the 2015 Mobile World Congress in early March, where Prof. Valkama and researchers Timo Huusari and Dani Korpi from TUT, together with Dr. Yang-Seok Choi and Dr. Shilpa Talwar from Intel, showcased their full-duplex prototype. The demonstration attracted great interest from the industry and research community alike. Thus, it is clear that these recent advances in full-duplex device implementations show great promise for improving the spectral efficiency of the next generation wireless networks. In addition to successful research into in-band full-duplex transceivers, Prof. Valkama’s group at TUT has also made innovative progress in other fields related to 5G networks, such as 5G radio interface and radio system design, radio localization, transmitter linearization, and cognitive radio. Moreover, his group has been given recognition and praise for their work from the FinnishFunding Agency for Innovation (Tekes) and Academy of Finland.